In my last post I shared Chef Marty Yaffee’s delicious recipe for Three Kings Cake (Galette des Rois), along with photos of Marty at work on his creation. 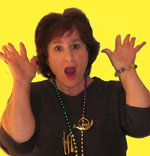 The French eat the Galette des Rois not just on Three Kings Day (Epiphany) but throughout the month of January. So naturally I was determined to make the Galette myself this month! I was also determined not to ingest all of its calories myself. 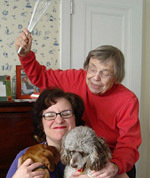 My mother and I invited friends and neighbors to dinner so that all could partake. Because I am naturally indolent the guests helped construct the Galette as well. I used Marty’s Blitz puff-pastry recipe so my pastry rose less than his classic puff pastry; it resembled an extra puffy butter pie crust. Someday I’ll try the real thing, but this time around I was comfortable making the simpler crust—and for me cooking is all about comfort! I also didn’t have enough almonds on hand to make the classic almond cream filling. So I made what I like to call a Galette des Rois à la Nouvelle Angleterre (New England Three Kings Cake) by using local apples in my filling. It was DELICIOUS. 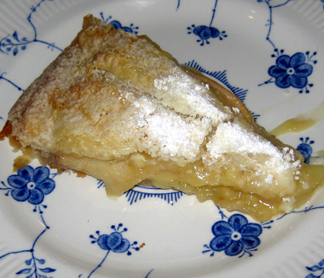 It felt and tasted like a warm, cream-filled apple turnover. My gala apples from Apex Orchards held their shape and texture in the oven and gave the Galette a warm crunch that contrasted nicely with the goopy cream and the melt-in-your-mouth pastry. 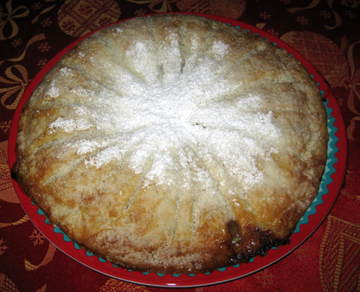 My guests also decided that a Galette might be a cake made by a petite gal (like me). Now this little gal will walk you through the process of making it. Nothing in this recipe is difficult, but you do need to allow most of a day to make it. The labor won’t take all day (I happily wrote and did other chores in between brief spurts of Galette), but there are lots of resting times involved. I started the pastry, then made the pastry cream and chilled it. I actually rolled out the crusts a couple of hours in advance (I’m a messy roller) and chilled them in their shapes, but you may roll them at the last minute as well. We cut and sugared the apples just before putting them into the Galette so we wouldn’t have to worry about discoloration. First begin the puff pastry. 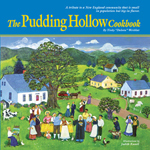 Put the flour in a medium bowl, and make a well in the center. Place the cubes of butter in the well, and sprinkle the salt over everything. Using knives or a pastry blender work the butter cubes into the flour until the mixture starts to look grainy but still shows small flakes of butter. Add the water, a little at a time, until the dough just comes together. 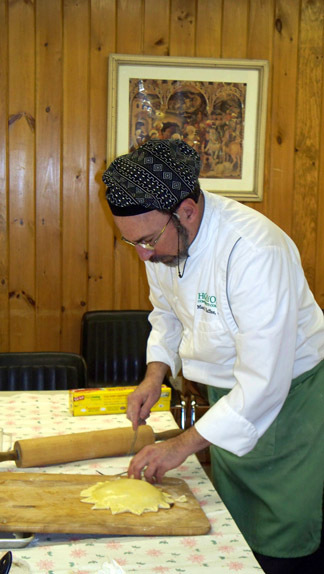 On a lightly floured board roll the dough into an 8-inch square. Fold it over itself in thirds (as though you were folding a letter to go into an envelope). Turn the dough 90 degrees (so that the horizontal part of the dough becomes vertical) and roll it out again. Fold the dough into thirds again and refrigerate it, wrapped in waxed paper, for at least 30 minutes. Repeat this process twice more. (The dough will become easier to roll as you go along!) 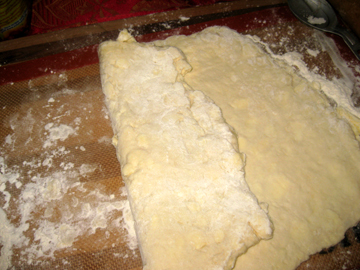 After the third double folding, cut the dough into 2 pieces so that it will be easier to roll out into top and bottom crusts. Refrigerate those pieces for 30 minutes more. For the pastry cream heat the milk in a heavy saucepan until it is very hot (don’t let it come to the boil, however). Remove from heat. In a small bowl combine the sugar, flour, and salt. Whisk them into the hot milk and blend completely. Put the pan back on the stove over low heat and cook, whisking, until the sauce is thick and smooth (somewhere between 3 and 5 minutes). Remove the pan from the heat again. Whisk a little bit of the milk mixture into the egg yolks. Whisk in a little more, then a little more. You want to get the yolks used to the heat of the milk without curdling them. When the egg yolk mixture has been well heated by adding bits of the sauce, stir the egg yolk mixture into the other ingredients in the saucepan. Cook for 2 to 3 minutes over low heat, whisking. Remove the sauce from the heat and let it cool to room temperature, whisking from time to time (this took about 1/2 hour in my kitchen). Stir in the vanilla, and put the sauce in a bowl. Cover the sauce with plastic wrap (making sure it adheres to the top of the sauce to keep the sauce from forming a film) and chill it until you’re ready to assemble your Galette. When you are almost ready to bake the Galette, preheat the oven to 425 degrees. Look around in your kitchen for two round objects (plates or bowls or one of each!) that are between 8 and 10 inches in diameter. One should be about an inch wider than the other. Roll out one of the pastry halves so that it is a little larger than the smaller object. Place the object on top of the rolled pastry and cut around its outline so that you have a round of pastry that is as wide as object. 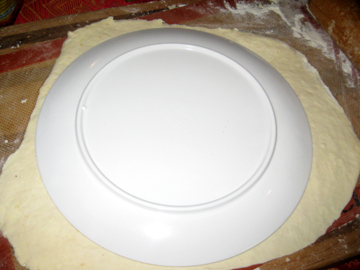 Line a baking sheet with a silicone mat and place the smaller pastry round on it. Quickly core and slice the apples. (You won’t need to peel them.) In a bowl combine the sugar, cinnamon, and salt for the apples, and toss the apple slices into the mixture. Return to the first pastry round. Using a spoon or brush dab a little egg wash on the outer edge of the round; it should go in about 3/4 inch from the edge. Spoon about half of the pastry cream inside the egg wash; that is, don’t go to the edges of the pastry. 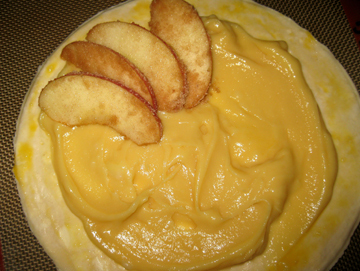 Place the apple slices on top of the cream. Place the nut somewhere on the apple slices. Top with the remaining pastry cream. Take the other half of the pastry and lay it on top of the fruit and cream. Use a fork to press the two layers of dough together; then score the top surface of the crust with a sunray design. My sunrays were plain old rays instead of Marty’s artistic swirls, and I actually did them BEFORE I put the top crust onto the Galette in order to avoid making more of a mess. Dab a little more egg wash on the top. Place the Galette in the oven. Bake for 10 minutes; then reduce the heat to 375 degrees. 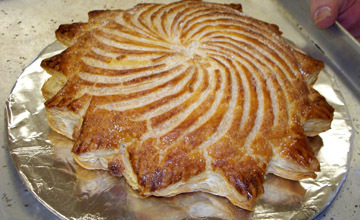 Bake for another 15 to 20 minutes, until the Galette springs back a little when you touch it and looks done. Remove the Galette from the oven and increase the oven heat to 475 degrees. 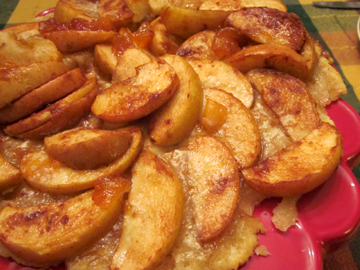 Use a sieve to dust confectioner’s sugar onto the Galette; then return it to the oven to cook again quickly. Marty’s confectioner’s sugar made a lovely glaze; I used a little too much so the smoke alarm went off (and I removed the Galette from the oven!) before a glaze formed. 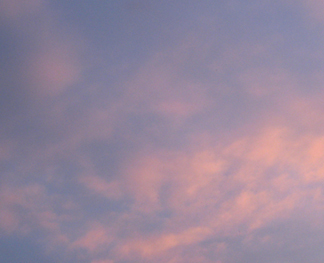 It was still quite pretty (if not his work of art), as well as warm and delicious. Serves 6. Leftovers make a terrific breakfast.